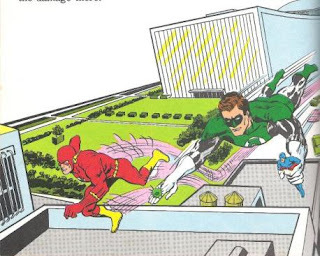 I’ve already talked about the Leaf mini-comic that is one of my first memories of the Flash. Today we’re going to look at another one of them. 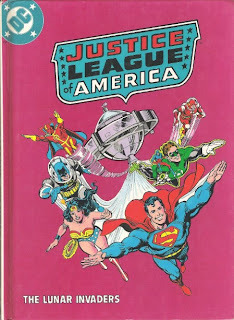 Justice League of America: The Lunar Invaders. Published in 1982 it is a 62 page hardcover book that came with an audio tape that read the story to you. Written by Marv Wolfman and illustrated by Ross Andru, Rich Buckler, Bob Smith, Bob LeRose. At the sound of the beep, turn the page. No wait; just click the link to find out more about the Lunar Invaders. The story starts out talking about Moonbase Peace, a United Nations type project with someone from almost every country working on it. 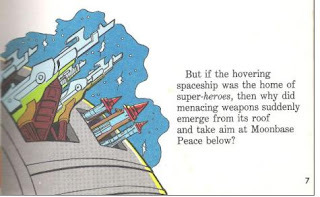 Suddenly the Justice League satellite opens fire on the moonbase. Check out the armaments on the satellite. Who knew it armed to the teeth. 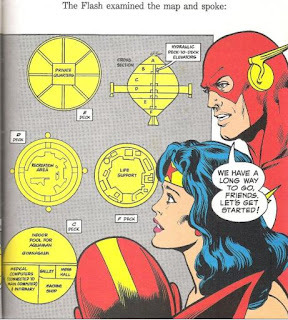 Anyway, the call goes out and the Justice League must break into their own satellite to find out what is going on. Batman and Superman are visiting the moon while the rest of the team has to deal with the security systems of the satellite. Every team member has a moment to shine, using their power to get past a specific obstacle. 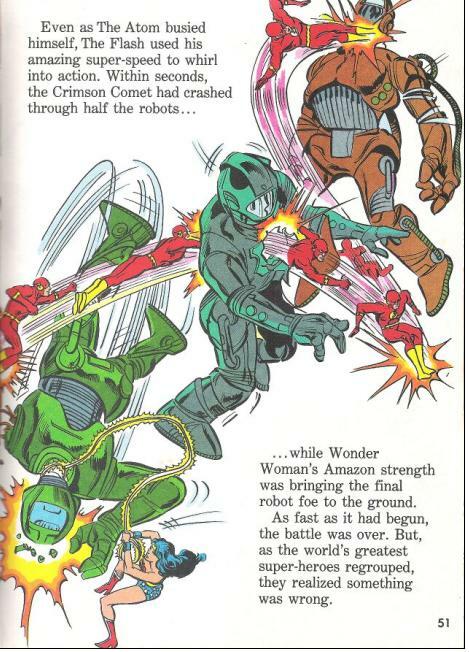 Green Lantern makes some constructs, Wonder Woman deflects some lasers, the atom jumps through some saw blades, and the Flash destroys a bunch of robots. Seriously, that is the big Flash “action page”. Besides that, he doesn’t do a whole lot in the book. He has a couple lines but nothing important. Regardless, there was something about the robot page that just struck me as cool. Enough so that I’d say at that point I knew he was my favorite superhero. In the end the Justice League get to the bottom of the attacks and make everything all better. But while researching this book, since my copy was long ago lost in my Grandma’s house, I found something oddly Muppet related. 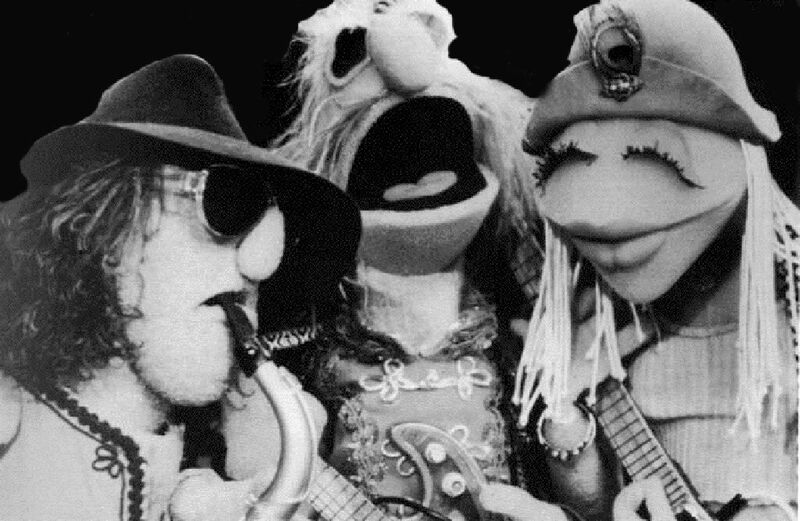 It was directed and composed by Christopher Cerf; a record and television producer know for his musical contributions to Sesame Street. Besides doing all that, he also voices the Atom in this one. Engineering was done by Doug Epstein (engineer on the albums Born to Add and Jim Henson Presents Silly Songs). Guest Piano Soloist, Genevieve Cerf (Christopher Cerf's wife). Narrated by Kathy Mullen famous for being Mokey Fraggle. Jerry Nelson as Green Lantern and Yuri Pudovkin. Jerry Nelson is awesome for being in like everything. Creating Count Von Count and being Floyd. Richard Hunt as The Flash and Han Chin. Hunt is probably best known for being Scooter. Michael Kingsbury Frith as The Batman. He is an interesting choice because his long list of Muppet accomplishments are for art direction and design consultant. Frederick R. Newman as Red Tornado and an Alien was a one time writer for Muppet Magazine and known mostly as a voice actor.